Sorry for the recent silence, guys. I’m trying not to fall victim to the all-or-nothing tendencies that are so common with us ADHDers. God knows it’s hard for us to find balance in our lives…and there’s a lot of other stuff going on (personally and professionally) right now that’s currently sucking up my energy. I want to post frequently, but I don’t want to post just to post. The content needs to have some value. I don’t want to just spam you guys, you know? Still, even if I can’t compose an epic post, because of whatever it is I’m struggling with at the moment, I guess that’s kind of what I’m supposed to be sharing, too. While I try to take the positive approach to my own ADHD (and other) issues, it’s not all sunshine and roses. It would be silly of me to pretend that it is. Honestly, it would be condescending of me to even think that I could convince you that life with ADHD is always awesome. Nobody’s life is awesome all the time. You know better than that; I don’t take you guys for fools. 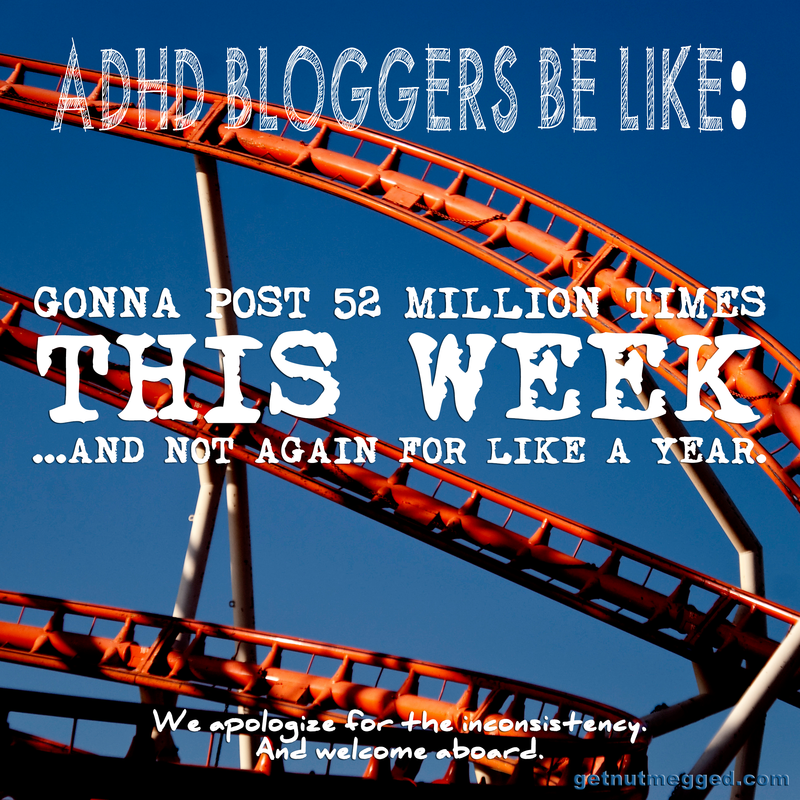 A lot of you are living the ADHD life, too, so you totally get it. If I pranced around here all the time only talking about the benefits of having ADHD, I would probably lose my credit as an ADHDer. There are good days and there are bad days. (Good/bad weeks, good/bad months, good/bad years…you get the picture.) And I won’t pretend otherwise. I have plenty of content ideas, but I just haven’t had the energy to put a post together lately. Life is all about priorities, though. You need to do what makes you happy and you need to spend time on the things you value most. We all have limited time – both on a daily basis and in the grand scheme of things. You (I) have to be smart about how you (I) spend that time and energy. Thing is…this blog (and all you guys reading it) are a priority. It makes me happy to know that people are getting something from my posts. Be it a good laugh, the ability to relate and know you’re not alone, some kind of inspiration…whatever it is that you get from my blog, I owe it to you to not drop the ball on this. Hell, I owe it to myself. After all, my whole life I’ve just wanted to make a difference. If this is that chance, I better not screw it up. So, yeah, adding pressure to a situation? “…always encourages an ADHDer to stick to something,” said no person with ADHD ever. Oh well…here goes nothing. Who’s with me?